Apologies as this paper is going to diverge somewhat from the published abstract, though I will be focusing on children’s publishing and issues of diversity and representation, drawing partially from the interviews mentioned. But I wanted to focus on what has been preoccupying me over the last few weeks. I’ve been thinking a lot about white privilege, thanks mostly to my friend Zetta Elliott who is mixed-race, a children’s book author, an academic, and someone who is never afraid to speak her mind. This is partially in light of the recent arrest of Henry Louis Gates, Jr., the distinguished African American academic from Harvard who was arrested after being suspected of breaking into his own home. The media in the US came alive, mainly with white reporters and radio djs defending the actions of the police. Once again, as with OJ Simpson, even Michael Jackson, there seems to be a divide between white and black responses to events. Zetta pointed me towards two white critics who discuss white privilege, Tim Wise and Peggy McIntosh. Both examine how white people are able to live their lives with unfair advantages, while having very little understanding of, or willingness to accept, that this white privilege exists. Wise created a three-act play on his blog showing how his interactions with police over his lifetime were based in a completely different dynamic than the one which most black people, particularly males, would most likely experience. For instance, when attempting to break into his car after he'd locked the keys inside, a policeman offered assistance rather than suspecting Wise of committing a crime. McIntosh has created a list of 46 circumstances in which white skin offers an unearned advantage, such as being able to choose the company of her own race most of the time, shopping without being followed by store detectives, and criticizing the government without being seen as a cultural outsider. This makes me think about my role as a white editor who has worked with non-white authors, and it makes me consider my role as a white academic focusing on issues of diversity and representation. (A note about terminology: while I know that "people of color" is the preferred term in the US, it doesn't communicate in the UK. "Non-white" is the inadequate alternative term I am using). Zetta Elliott, on her provocative blog, said she was tired of having to explain racism to white people. And I admire these above critics for taking on that responsibility, for examining the place and role of white people in the dynamic of racism rather than always focusing on the people of color. And in the area of children’s publishing, I’ve been deeply disturbed by the recent controversy over the cover of a book called Liar, written by white Australian author Justine Larbalestier. In this case, American publisher Bloomsbury put a white girl’s face on the cover of her book, even though the author has stated (in her articulate blog post about the cover) that she meant the girl to be black. 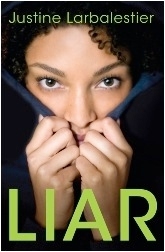 Bloomsbury defended their decision by saying that the cover implied that the girl, a pathological liar, might even be lying about her race. The Publishers Weekly article which offered Bloomsbury’s defense also disturbed me, with the lack of outrage, and the inclusion of comments from people who said they could understand why this cover, which they thought looked nice and was eye-catching, was chosen for the book. There was a huge outpouring of response on the blogosphere, neatly summarized by blogger Chasing Ray. But what of the mainstream, the media, the publishers themselves? It shocked me that the publisher would justify putting a white face on the cover of a book about black girl. Some have described the United States as being post-racial since the election of Barack Obama, but situations such as the Gates arrest and this book cover controversy convey quite the opposite. From this I turn to my own experiences working in the children’s publishing industry. I spent seven years in the US in editorial departments, particularly at independent publishers of multicultural children’s books: Children’s Book Press in San Francisco, and Lee & Low Books in New York City where I was an editor. It was during this time that I experienced and started to question the role of the publishing industry, and particularly the author/editor relationship in the publication of “multicultural” picture books, a term which, in the books I worked on, generally meant those written by non-white authors and reflecting the experiences of non-white children. I became aware, over time, of how my reaction to manuscripts was based within my background – class, race, education, and gender. I had certain expectations of the types of stories that were appropriate for children, ways of constructing a narrative, and content that was child-friendly. It was only in the context of working with authors from different backgrounds that these expectations were challenged, as when a Native American author explained to me that her story, in which a contemporary boy develops a conversational relationship with a rock, would not be considered “fantasy” in her culture. I also came to recognize the powerful force of market pressure on the juvenile publishing industry. While this exists to different degrees within large, corporate publishers and smaller, independent publishers, there is always the pressure to support the business and make money. What I found particularly striking was the degree to which perceived market requirements shaped the books that were acquired and developed. The publishers where I worked sold primarily to the institutional markets—to teachers and librarians. In my experience, there was concern about what teachers or librarians would accept, with a frequent “lowest common denominator” consideration of what the majority of those in the educational and library systems would tolerate. Finally, there was the question of defining the audience for whom the books were published. In the effort to produce books that reflected diverse experiences, but to do so for a so-called “universal” child audience, culturally specific aspects were sometimes amended or explained, potentially taking the book’s address away from those within the culture being depicted. Publishers control the first gate in the production of children’s books. Editors choose books to fit in with the past tradition of the house, current market conditions, and the mindset of that particular editor, all of which tends to make conventional books more publishable. The question here is not about particular racist individuals who work in the publishing industry, rather, this is an institutional problem. The way in which the acquisition, development, distribution and marketing of children’s books currently takes place is a system based on patterns that are so pervasive they seem to become natural, inevitable and justifiable. I would argue that most children’s publishing houses currently exist in order to serve the interests and needs of the white majority culture. From here, I want to give a fairly detailed example of one of the books I edited, showing what types of changes were made and why, as well as reflecting on how I see this process affecting the final product. I will then draw from one of the interviews I carried out with UK non-white authors and editors to elaborate on some of the issues raised. 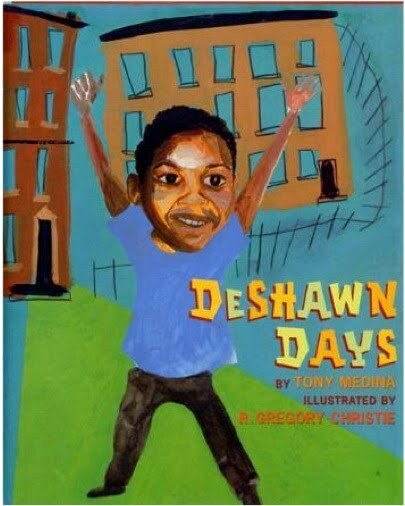 DeShawn Days was the first book I worked on as an editor at Lee & Low Books, and I want to look particularly at how the experience the author aimed to reflect was shifted by the publication process. The author, Tony Medina, initially submitted a few poems representing the life of a ten-year-old boy living in housing projects. When I wrote to say I was interested in seeing more, he sent many additional poems (far more than could fit in a 32 page picture book), and he and I worked together to select the poems for inclusion and decide on an order. Medina, who is African American and of Puerto Rican descent, grew up in the projects in The Bronx, and was living in Harlem when we worked on this book. As a politically-engaged performance poet, his aim was to write a book that honestly spoke to, and reflected the lives of, children living in inner-city projects. When I showed this project to others at Lee & Low Books (particularly the Managing Editor and the Publisher), there was a lot of discussion about the tone and darkness in the book. And I was asked to go back to the author and request various changes. The first was to come up with an alternative to Medina’s original title, DeShawn’s Dilemma, as it was seen as potentially too negative, and perhaps too complex or unclear for young readers. It was also suggested that the author remove a poem in which DeShawn has an asthma attack and goes to the hospital, as there was concern it meant the overall balance of the poems was too negative. I was asked to request that Medina replace it with a positive and celebratory poem about his neighborhood. This poem still feels true to Medina’s voice, but I don’t think it is one of the stronger poems in the book as it lacks some of the complexity of theme and tone found in the other poems (such as those about loving rap music, watching the news, or having a nightmare about graffiti). 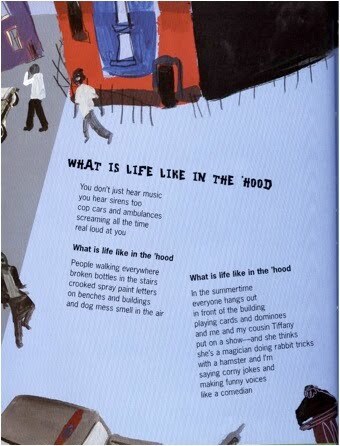 The poem focusing on DeShawn’s asthma attack would have provided an opportunity for those children to see that experience reflected in a book – both normalising it, and perhaps also providing an opportunity for those children to discuss the disease and its place in their community. Instead, a more generic and celebratory poem was inserted. Another situation revealed the difficulty in creating an insider’s perspective on this experience for a general readership. In the case of a poem entitled “What is Life Like in the ‘Hood?”, which describes the neighborhood where DeShawn lives, the words: ‘crack vials everywhere’ (8) were seen as problematic. The Publisher felt strongly that the mention of crack should not be included in a picture book, that this would cause teachers or librarians not to buy it. With initial resistance from the author, he eventually changed that phrase to ‘People walking everywhere’ (8). For the author, seeing crack vials in the neighborhood was part of the normal experience for most children where he lived. He didn’t see it as being controversial or too upsetting to urban children for whom it was part of daily life. But the publisher was concerned about how teachers and librarians might perceive it, particularly teachers and librarians working with populations who were not living in urban, inner-city areas. ‘Maughan’s research showed that people in suburban neighborhoods tend to find the book appropriate for junior or senior high school students, while those in urban settings think children as young as first grade need exposure to the story’ ( Koehnecke, Dianne. “Smoky Night and Crack: Controversial Subjects in Current Children’s Stories.” Children’s Literature in Education 32.1 (2001): 17-30. 25). This statement gets to the heart of the issues that drove editorial development for DeShawn Days. The author had grown up in a situation similar to that described in the book. His belief was that children living in this environment needed to see their reality accurately represented in children’s books, while children who did not come from this experience should not be overly-protected from the realities of this world. However, as Koehnecke writes, teachers in different environments have very different conceptions of what is appropriate for children and at what age. Teachers are one of the primary consumers for whom publishers such as Lee & Low are producing their books, and so they are cautious about not offending or upsetting those who might be uncomfortable with this type of book content. These examples reflect the difficulties in showing a particular experience from the inside, fully reflecting the child’s life as the author intended to, within the mainstream publishing environment. In this case, showing the world from the perspective of a boy living in inner city housing projects, including the reality of encountering crack vials as a normal part of life and exploring the reality of so many children suffering from asthma, were deemed intolerable to a majority of the teachers and librarians who would be the book’s consumers – reflecting a conservative, white middle class expectation of what is acceptable in children’s books. And this was in a small, multicultural publishing house – so imagine how this might take place in larger publishers which have less overt concern about diversity and representation in the books they publish. I carried out sixteen interviews with non-white authors and editors who had worked with non-white authors in the UK from the 1970s to the early 2000s, with an interest in exploring this issue further. I wanted to hear about which books were acquired and which weren’t, the types of editorial changes made, and how this process was perceived by both author and editor. I am still in the early stages of interpreting and editing these interviews, but I wanted to provide an example that feels emblematic of the issues I’ve been discussing, and reveals the pervasive presence of white privilege in the children’s publishing industry. I immediately pointed out the error when they sent me a cover proof, and [the editor] was like, “oh, well it really doesn’t matter.” And I said, “It really does matter.” And she said, “It’s going to be quite difficult to change it now, I’ll send an email around to see what people think.” And she wrote to me and said, “Everyone likes the title, they think it sounds stronger.” And I said, “I really don’t agree with it,” and she was like, “why,” she had no understanding of why I would disagree with it. 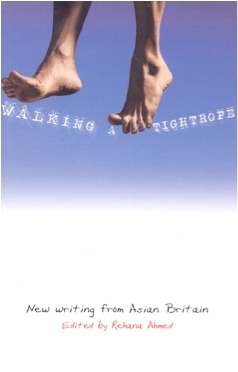 My reason was that I felt that “Walking The” was basically implying that there was some homogenous way of being Asian in Britain, it was “The.” And if you say “Walking A Tightrope,” it could be any kind of tightrope, it doesn’t have to be a cultural one. It could be moving from child[hood] to adolescence or from adolescence to adulthood, and those experiences can be incredibly different. Even the anthology itself troubles me for that reason because there is no unifying monolithic way of being Asian in Britain. That one word made a huge difference to me. The editor wrote back and said everyone still felt the first title was better. Ahmed left it for a week, polling friends and colleagues. I just gave them the two titles and said which is better? And they immediately got it. And why shouldn’t they? If they did, then I was worried about how other people would react, reviewers, if it got any press coverage, how they would react. If there’s anything negative, it’s the kind of thing which could attract negative attention. And I didn’t want to [upset] the authors. So I wrote back to [the editor] after about a week. I didn’t think I would be able to change it at that point, but I wanted to register that I completely distanced myself from this title. I told her that I had asked people about it, and was worried that it would get a negative reception. And she wrote back to say that they were going to change it, but in what I perceived to be a hostile way. In this case, the original commissioning editor had left, and the project was handed to someone else at Macmillan. Ahmed felt that this new editor was not comfortable working on minority books. She was from an educated, middle class background, and expressed nervousness when taking the project over, worried she would ay the wrong thing or be politically incorrect. Before the whole title fiasco, I had a couple of meetings and she was really nice about it, saying, ‘This was really interesting to me. What’s Roti, and I learned loads.” And I was thinking, it’s amazing that you’re saying that to me, it’s really good, but she didn’t know anything about south Asian culture, despite living in London for years. There are too many things wrong here, and it seems like too few people see it. The children’s publishing industry is blind, insular, and self-enclosed in too many ways. Yes, many good and well-intentioned people work in the industry, and most desire to make things better, to provide all children with wonderful books to read. But this is such a fundamental problem based on who primarily works in the industry, and even more so who holds the positions of power and dictates marketing and publication decisions. Perhaps self-publishing will be the way forward, the internet, the ability of people to bypass an archaic publishing industry that seems slow to respond to change. Though currently, self-published books lack the legitimacy that most children’s book buyers perceive from books that come out of publishing houses. At the Diversity Matters conference in 2006, Francesca Dow of Puffin said that by 2010, 1 in 5 schoolchildren in the UK will be from Black and Minority Ethnic (BME)) communities (you can see my full notes from the conference here). The United States grows more and more diverse as well, with a mixture of stories, backgrounds, ways of telling. It’s such an enormous shame that these voices and stories are mostly unheard and unpublished, and that those which do come through struggle to carry their original nuance and address. We regret that our original creative direction for Liar—which was intended to symbolically reflect the narrator’s complex psychological makeup—has been interpreted by some as a calculated decision to mask the character’s ethnicity. In response to this concern, and in support of the author’s vision for the novel, Bloomsbury has decided to re-jacket the hardcover edition with a new look in time for its publication in October. It is our hope that the important discussions about race and its representation in teen literature continue. 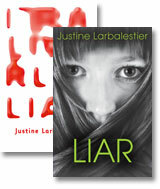 As the publisher of Liar, we also hope that nothing further distracts from the quality of the author’s nuanced and accomplished story, and that a new cover will allow this novel’s many advocates to celebrate its U.S. publication without reservation. Which allows me to close on a more positive note. This does not mean that the problem is solved, and there is still the issue that the girl is lighter-skinned and more girly or traditionally ‘pretty’ than the author seemed to intend. But in this case, a public outcry and the power of the internet pushed a publisher to make a change, at an estimated cost of around $7,000 to rejacket 100,000 books. Perhaps the tide is turning, and there are too many people paying attention for this level of outright racism to continue to exist. We’ll have to keep watching and speaking out. I read over your paper from your blog entry. I found a few inaccuracies and a point or two you may be missing in your argument. of such displays of "reality". White teacher and librarians are not the only one that would find the use of crack vials offensive. Black folks would as well. that, with regard to white skin privilege and cultural pride, the issue is not solely one of institutional racism, but of class as well. I hope these points help you with your work. I really would appreciate people posting their thoughts and reactions on the blog. The more voices we have speaking on this issue, the better.